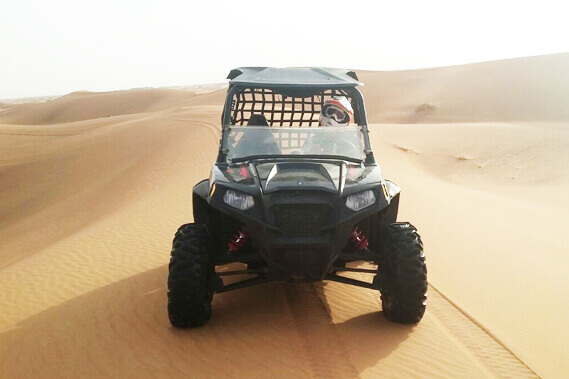 Rent a Buggy in Dubai and DuneBikeDubai will take you into the highest dunes of the regions. We take the idea of thirst for escapade which a tourist look for and delivers the unforgettable options you can have by setting aside the daily routine. It is time to leave all the stress back in the office. Pump up with excitement, wear your gloves, tie the laces and ride along with us. 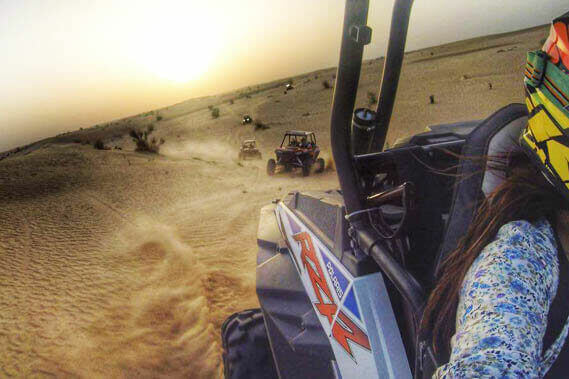 The exhilaration of a Buggy Dubai ride will leave you spellbound. Start up the engine and ride the dirt as it meant to be. You will discover a new person who pushes the limits to touch the ground. 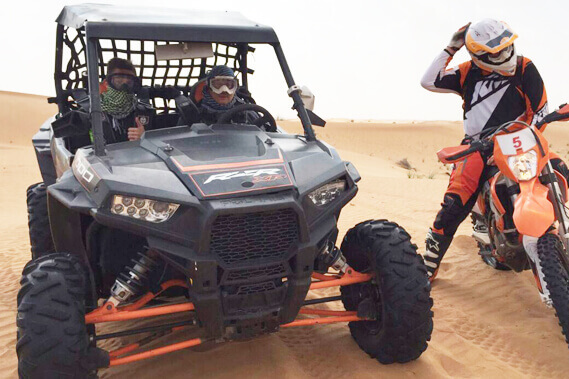 Offering Buggy Hire Dubai, DuneBikeDubai provide all the gears you expect to get. 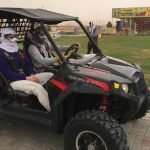 Whether you are planning for a short Buggy riding in Dubai experience or it is just a hobby you want to adopt, our expert riders will help you during the journey. For more information or bookings send us an email via our contact form or simply send us a whatsapp message for a quick reply. 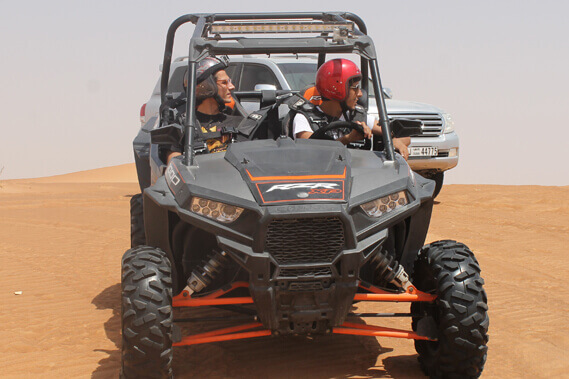 The team of DuneBikeDubai wants you to enjoy when you rent a dune buggy in Dubai. 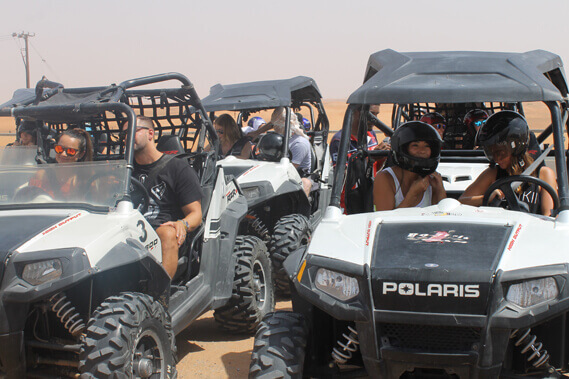 Our safety advisors with a long years racing background invented and continuously update our dune buggy tour Dubai safety guidelines. 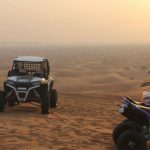 There are a few places in the UAE where you can rent a dune-buggy and explore the desert yourself and on your own risk. 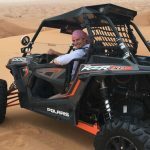 We often get stories told from clients friends who rented a off-road-dune-buggy for their first time off-road, but had no idea how to drive it in a safe way. A lot crashed because they didn´t even got told the basics. Some got seriously injured due to lack of safety equipment. 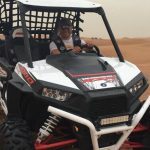 It can seem like there’s a lot to learn when you’re first starting out in a dune buggy, but don´t worry, dune buggy tours at DuneBikeDubai include a helpful instructor that will provide you with plenty of suggestions along the ride. Here are some basic facts for beginners off-road. 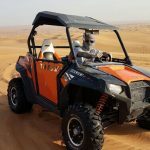 The weather might be important to dune buggy safety. We go on tour even in the rain, and yes you’re going to get wet. Rain is such a rare thing in Dubai that you actually have to experience it. 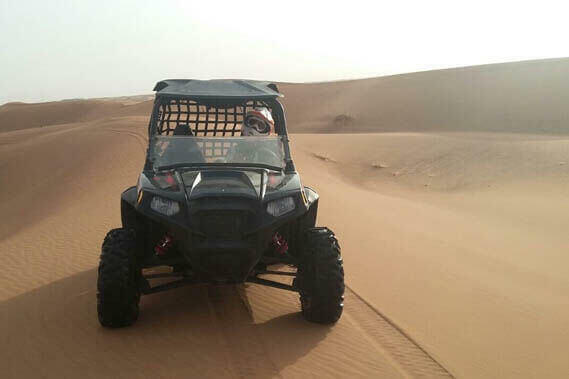 The sand will get solid and harder and the buggy can transfer its full power to the ground, while on soft sand a lot of the power gets absorbed by just spinning wheels. 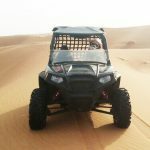 In muddy areas, the dune-buggy can become stuck or it can slip and slide, but this is not common in the areas in which we drive. The soft desert sand just absorbs the water very fast like a sponge. 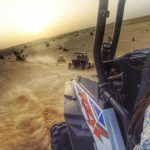 A dune ATV is a rugged vehicle, but speeding over the dunes and plowing through soft sand means the vehicle could slide and tip, causing injury to you and your passengers. 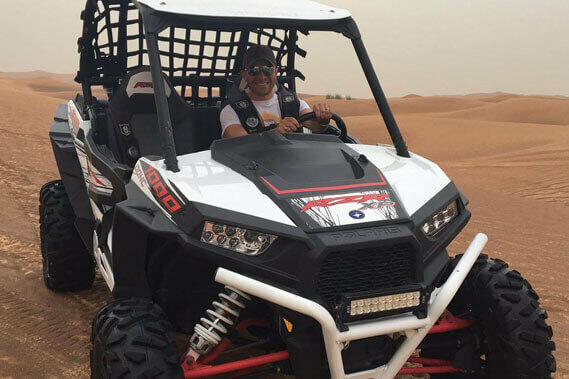 On your tour you will learn how to avoid dangerous situation and always stay safe on your buggy tour Dubai. With DuneBikeDubai you ride fast but also safe. 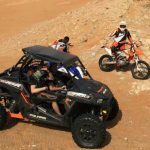 Let´s check out some basics of buggy riding. Proper Buggy Safety equipment: This is the base for a safe buggy ride. 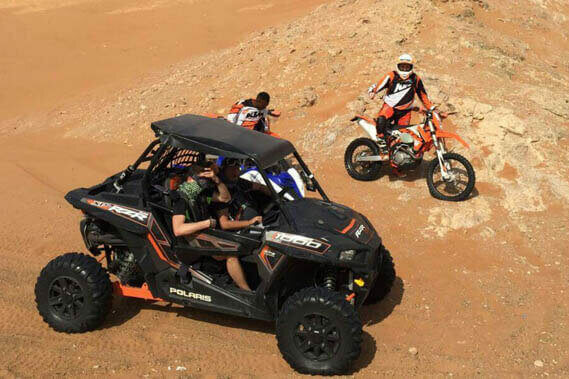 DuneBikeDubai provides you with the latest onboard safety equipment such as 5 point racing seatbelts, door panels to prevent your arms and legs to reach out of the ATV, strong front bumper to avoid the costs of a damaged ATV front in case of an impact, massive roll cage and wheel spacers for a more stable ride in corners. 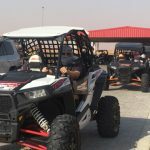 Driver safety equipment: While in our safety briefing we will provide a wide range of gear that will make your buggy experience much safer. 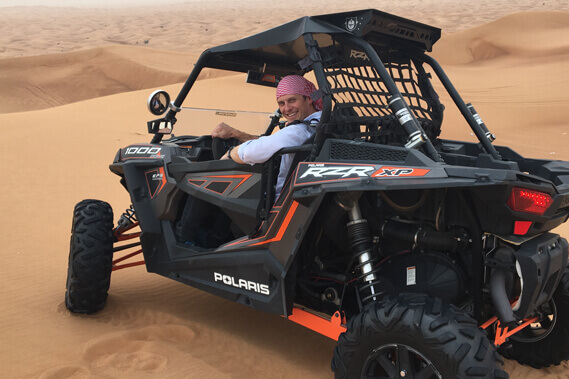 Most important is the racing helmet with proper goggles that doesn´t let any sand get to your eyes because it seals right on your face. Long sleeve racing shirt and gloves will protect your skin from injuries caused by small stones or bushes that you pass on high speed. We can provide you with solid racing pants if you want to play around in a sand but don´t want your own pants to be damaged. Additionally you can choose from a wide range of body protection tools for your knees, elbows or chest. 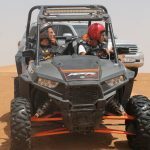 Safety guidelines in the buggy: Now that you are dressed up and sitting in a safe dune buggy it´s time to have a looks at the driver and his passenger in the buggy. Always keep your legs and arms inside the buggy. Leaning the elbow on the door might look nice but in the event of an accident your arm will be injured badly. Keep your hands on the steering wheel and focus on your ride. There is a special handle bar for the passenger that he can hold tight during the ride. 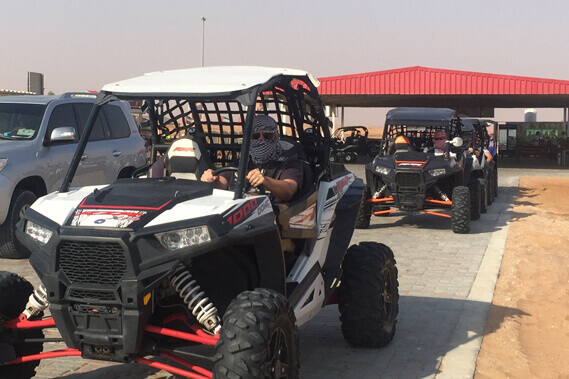 Once you are in the ATV the best advice we can give you is to open your eyes and use them to spot other vehicles or dangers around you. 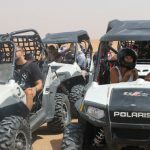 Safety instructions for the ATV-buggy tour Dubai:We know it’s fun to drive a dune buggy fast, but you always need to be careful when you’re at the steering wheel to make sure you keep control of the ATV. Making tight turns or 360s might look cool but don’t attempt them at any time of the tour. 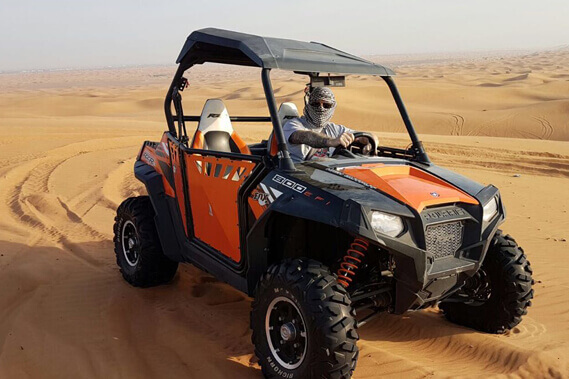 The buggy will roll over most of the time because the sand in Dubai is very soft and the outside wheels sink in very fast. Take your foot off the gas before you turn and then accelerate out of the corner. 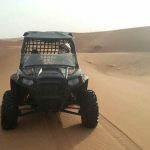 You are in control of a very powerful buggy so stay aware of your surroundings and watch out for potential dangers once you are on top of a dune. 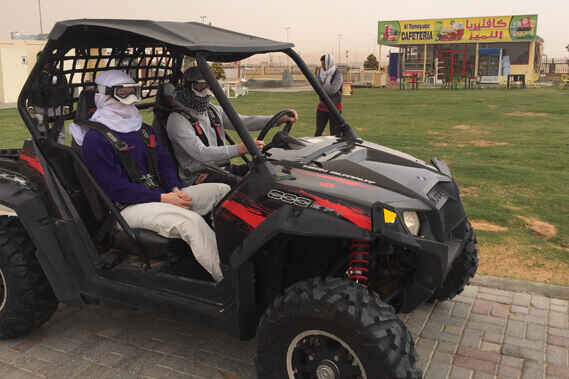 All these safety tips might sound heavy for the first time but don’t worry, a Dubai-buggy-rental is alot of fun. 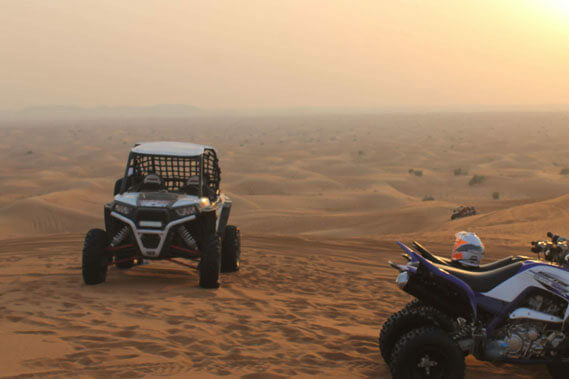 Relax and enjoy the amazing Dubai desert with its fast trails, massive mountains and height dunes. If you are not sure what to do out there or how to manage tricky situations just stop your ATV and wait for your guide to help you. He has an eye on you.